A food supplement with 4 microbiotic strains in the dose of 30 billion bacteria per orally dissolving stick. With Sweetener. Orally dissolving powder in the stick instantly dissolves in the mouth, allowing for a quick administration without water. 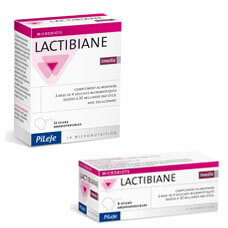 Microbiotic strains in Lactibiane Imedia selectively bred by PiLeJe are registered in the National Collection of Microorganism Cultures (CNCM). Take 1 orally dissolving stick daily. Use without water. Duration of use: 4 to 12 days. Use-by date and batch number are indicated on the side of the carton. Sweetener: xylitol, bulking agent: maltodextrin, lactic ferments.